The first Italian round of the World chef at the Circus of the flavors market. 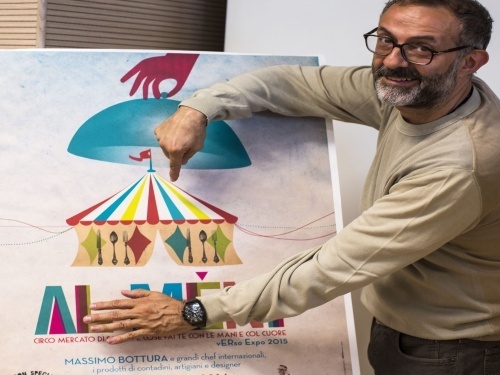 Upon his return from New York, will be the circus of flavor ‘s market Al Meni Rimini the first official release for the newly elected Oscar of world cuisine Massimo Bottura, just hoisted on the top of the “50 Best Restaurant”, the ranking was born fourteen years ago by British Restaurant magazine and considered the highest in the catering industry. On 18th and 19th of June Rimini becomes in fact the capital of taste into felliniano circus around which is held at Meni, a unique event in show cooking, wine tasting, gourmet street food, the market of the top products from Emilia Romagna, workshops for children and adults, handicrafts lab store and starry ice cream. The Circus is a remake of 8 and ½ (Fellini film) whole gastronomic that will be built in the shadow of the Grand Hotel of Rimini in June 18 to 19 with ‘Al Meni’ (in local dialect “hands”) the title of a poem by Tonino Guerra – the circus of flavors between wine tastings market, starry show cooking, workshops, meetings with authors and experts, the market of manufacturers of excellence, gourmet street food and handicrafts lab store. Heart of the it will be the colorful circus tent, a tribute to the spirit of Fellini’s dream, which for two days turns into a large open kitchen, where Massimo Bottura calls together 12 chefs from the Emilia Romagna to meet 12 young international chefs with the aim of bringing the gourmet cuisine in to a wider audience of curious and passionate. Among Italians chef of this year edition we recall the starred Aurora Mazzucchelli, Maria Grazia Soncini, Terry Giacomello, Gianpaolo Scrape, Gianluca Gorini, from Lima in Peru Emilio Macias, Brazil Tabata Hanninen, then the Irish Rose Green and US Rosio Sanchez. There will be also Simone Tondo and Japanese Takahiko Kondo. As well the Swedish star chef Niklas Ekstedt. And then Leonardo Pereira, Mathias Bernwieser, James Lowe, John Cuocci, Silver Succi, Rino Duke Philipp Rachinger, Diego Prado, Sven Chartier, Emilio Barbieri, Alessio Malaguti, Stefano Ciotti.